Join Tambo Ilusion for a journey of self-discovery as you explore this wonderful healing art and its amazing possibilities. Dedicate four days to discover a new and delightful ability in yourself. Reiki is a wonderful form of self-care that helps reduce overall stress and bring about overall well being. You are invited to partake in Tambo Ilusion's Reiki initiation retreat, which consists of attunement to the first degree of Reiki to learn to heal with your hands. Offer yourself the wonderful opportunity to learn and share the Usui Reiki system - which is a simple, non-invasive healing system that balances the body's energy centers. It is one of the easiest and most natural forms of holistic healing there is. If the luxury of a 5-star establishment is what you are looking for, Tambo Ilusion might not be for you. Tambo Ilusion is not a resort, it is more of a countryside home. Tambo Ilusion is a place for nature lovers. At Tambo Ilusion, guests sleep in "tambos", which are cozy rustic wooden cabins that are equipped with two very comfortable double beds and mosquito nets. Each tambo has a hammock hanging on its porch. The accommodation offers an electricity-free environment in the cabins, favoring the best ambiance to disconnect and rest. Tambo Ilusion is proud to offer an environment that has low exposure to electromagnetic fields (thus Wi-Fi service is quite limited). You will be provided with amenities such as clean, spacious shared bathrooms, which are separate from the rooms and have flush toilets and hot water showers. Tambo Ilusion, considered one of Peru's top five yoga retreat centers by Peru’s most prestigious newspaper El Comercio, is dedicated to offer its guests a wonderfully rich experience at a reasonable price. Not only will you leave this retreat feeling empowered, recharged, refreshed, and inspired, you will also have the satisfaction of having made a difference contributing in helping Tambo Ilusion protect a small part of the Amazon jungle. Tambo Ilusion is proud to share the award received from TripAdvisor: "Certificate of Excellence 2017". Tambo Ilusion has received this same recognition in 2015 and 2016. This award celebrates excellence in hospitality, and is given only to establishments that consistently achieve great traveler reviews on TripAdvisor. This is an effective workshop for people who are interested in stress management, self-healing and personal growth with the added benefit of learning how to channel healing energy to help others, too. The ability to channel Reiki is then with you for life, and the more you work with it, the more you will be amazed at its inspiring power. Leave your doubts behind and jump head first in to this life changing experience. This retreat is a wonderful all-inclusive option which offers each participant the opportunity to soak in the Reiki energy and just "be" in order to become more in touch with this wonderful energy so that it can flow more freely through you and your life. Gentle yoga and guided meditation sessions, delicious healthy vegetarian meals, nature walks, an herbal bath, and free time to enjoy the natural beauty of this nature conservation area will assist you in your Reiki attunement process. This program is for anyone who wishes to be introduced to Reiki in a calm and beautiful environment. It is possible to gain your first degree (out of three degrees) in a short stay with Tambo Ilusion. You will be able to channel Reiki healing to yourself and to others before the end of this retreat. "When you heal yourself and assist others with their self-healing, you heal the earth. You do make a difference!" A quote by Laurel Steinhice, Channeling the Earth Mother. Reiki is a Japanese technique for stress reduction and relaxation, which promotes healing as well. It is a form of hands-on healing used to cleanse, balance, and heal while invigorating the mind, body, and soul. You’ll discover how to balance your chakras with Reiki. For those of you who have never received a Reiki treatment, it is a wonderfully relaxing and nurturing experience. A typical Reiki session typically lasts one hour. Reiki is not taught in the usual sense; it cannot be learned from a book or self-taught but is transferred by the Reiki master to the student through the attunement or initiation (attune means harmony, and initiate means ceremony) process via a simple ceremony which is repeated at intervals over the course of the retreat. This is not just a Reiki course, this is the start of a very special journey. During the retreat, you will receive four initiations or attunements that literally "attune" you to the higher energy of Reiki to empower yourself as a conduit for channeling life-force energy for both yourself and others. Each Reiki attunement is a relaxing and beneficial experience. The Reiki system of channeling universal vital energy, which is not unique, is characterized by its simplicity. It is easy to learn, easy to practice and it is easy to transmit. Currently, Reiki is practiced by millions of people around the world for its great benefits. Reiki can be performed in different ways. The receiver of Reiki can lie on a massage table, on a mattress, on the floor or sit in a chair. The receiver remains dressed during a Reiki session. A Reiki practitioner, by using gentle touch can increase the life force energy that will facilitate healing and relaxation. 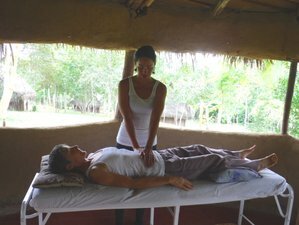 The practitioner will act as a channel for the healing energy to flow through to the receiver. Although traditional Reiki involves "hands on" healing, if you are uncomfortable with healing touch, energy can effectively be sent into the aura from an appropriate distance. There is an emphasis on practical experience throughout the retreat, as it is important that you develop your own individual skills and knowledge of Reiki. During the course, you will learn the hand positions for self-healing, as well as for treating others. One of the wonderful things about Reiki is that it starts with taking care of and appreciating yourself. You will also learn to practice Reiki on plants, animals, the environment, and situations. You will receive two Reiki treatments, one guided auto-treatment, and you will give three Reiki treatments. Alongside Reiki attunements and training you will learn about the chakra system, and more. You will leave this retreat a Reiki enthusiast. Johanne Delisle, originally from Montreal, Canada is a certified Hatha yoga and SUP yoga instructor. She has over 2000 hours of teaching experience worldwide. She completed her first yoga teacher training in 2004. Since then, she has trained in the schools of Iyengar and Anusara yoga. Johanne holds a vegetarian nutrition certificate and is a certified mind-body eating coach. She is awarded with TripAdvisor's Excellence Award 2015, 2016, and 2017. As seen in National Geographic Traveller, Tambo Ilusion is a beautiful nature reserve of 14 hectares (34.6 acres) recognized by the Ministry of Environment of Peru as a Private Conservation Area (ACP). Tambo Ilusion is located in the rural area of Tarapoto, situated in the San Martin region of Peru (in the Amazon jungle). Tarapoto is the main gateway to the northeastern jungle of Peru, at an altitude of 356 meters above sea level, and it is located in the San Martin province of the San Martin region, midway between the high jungle and the Amazon plains. Tarapoto is linked to the Upper Amazon and the historic city of Yurimaguas by a relatively well-maintained newly paved (2008-2009) "Trans-Andean" highway. Tarapoto is the main tourist hub of this part of Peru, and it is often used as a "jump off" point for excursions into the vast Amazon rainforest where diversity in species reaches its maximum expression, such as in Tingana and Pacaya Samiria national reserve, and for tours of the north east of Peru, including the Chachapoyas culture in Amazonas with its fascinating but not well known archaeology and history, the Gran Vilaya ruins, and the Kuelap fortress (the Machu Picchu of the north). Furthermore, beautiful landscapes, amazing waterfalls, lagoons, orchids, adventure tourism such as river rafting and hiking in the tropical Andes, as well as bird watching attract numerous visitors to this area. Tambo Ilusion is located in the Banda de Shilcayo district which is at the eastern limit of Tarapoto city. It is near the waterfalls of Ahuashiyacu, a main attraction of the area. Wholesome vegetarian meals are prepared three times daily. Meals are shared in Tambo Ilusion's house family style. Fruits and vegetables are fresh and seasonal. Some of the fruit come from their own trees (citrus, papayas, mangoes, bananas, star fruit, etc.). Special dietary needs can be accommodated with advanced notice. From Tarapoto, head towards El Distrito de la Banda de Shilcayo on the highway to Yurimaguas. At kilometer 2.5 of highway to Yurimaguas (just past the entrance to La Laguna Venecia), there is a dirt road on the right. Take that dirt road. You will soon come to a fork, keep right. Tambo Ilusion is about 500 meters from that fork. Peru is currently a very popular travel destination so it is recommended to book early for international flights (to Lima, the capital) and domestic flights. Airport taxes and fees are now included in the price of the tickets for international as well as domestic flights. The flight from Lima's International airport (LIM) to Tarapoto (TPP) takes one hour and fifteen minutes. There are four airline companies that fly daily to Tarapoto (Star Peru, Peruvian Airlines, LATAM and Viva Air). The flight from Iquitos (IQT) to Tarapoto (TPP) takes one hour. Tambo Ilusión is located 15 minutes away from the airport. Transfers to and from the airport by mototaxi are included. Passing through Chiclayo, to get to Tarapoto is a 30-hour bus ride (approximately 1500 kilometers or 930 miles) on a good highway. There are two decent bus companies: Movil Tour and CIVA. To make the trip easier, look into the possibility of cutting the trip by stopping in Chiclayo, a coastal city, for a day or two as the route goes that way anyways. In Chiclayo, there are 2 important museums: Museo Nacional Tumbas Reales de Sipan and Museo Bruning. Getting to Tarapoto by bus from any town north of Lima along the Peruvian coast is relatively easy. The other option is a bus route from Lima going through Tingo Maria. This route is about 500 kilometers less mileage than going through Chiclayo, and it takes about 23 hours. The bus goes through the Andes to get to the jungle; it passes through a city called Ticlio which is at an altitude of 4818 meters. There is a 3-day boat ride Iquitos - Yurimaguas on the Huallaga, Maran, and Amazonas rivers. Once in Yurimaguas, take a bus to Tarapoto (a 2 hours and 30 minutes ride). Airport: Cad. FAP Guillermo del Castillo Paredes Airport Airport transfer included: Cad. FAP Guillermo del Castillo Paredes Airport No additional charges. You can request this in the next step. The rest of the payment should be paid 5 days before arrival. Tambo Ilusion is a beautiful Amazon nature reserve worth discovering. It caters to wellness seekers and nature lovers. This vacation is available all year round except for March and August and guaranteed to take place even if only one person signs up. Please select your arrival date below. If you are paying the remaining amount in cash, you can pay upon arrival.